If you set this option to Yes, users that will complete the registration form will be automatically logged in. Checking this option will prevent users from being logged in with the same account from multiple places at the same time. If the current user’s session has been taken over by a newer session, we will log him out and he will have to log in again. This will make it inconvenient for members to share their login credentials. 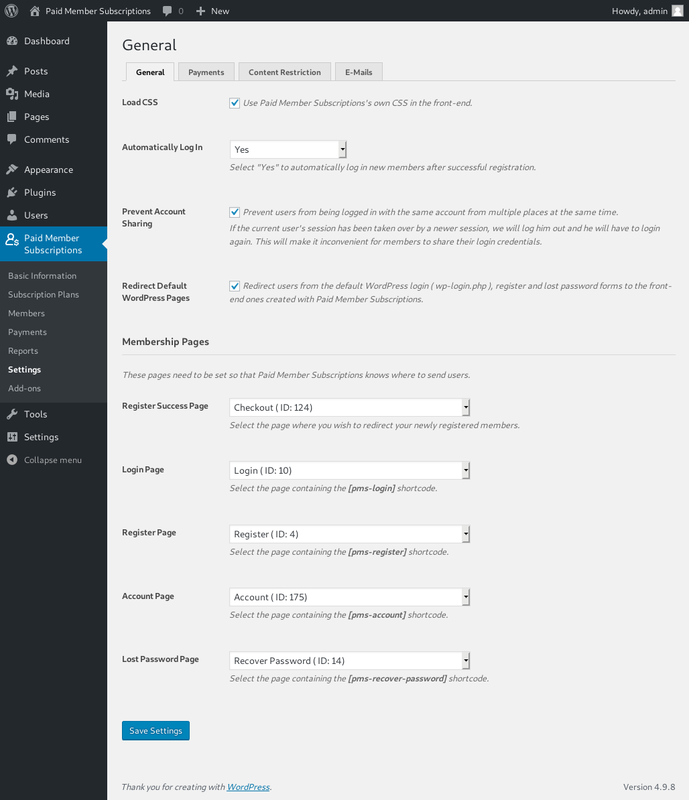 Redirect the default WordPress Login, Register and Recover Password to the front-end forms created with Paid Member Subscriptions. For this option to work, you need to select the pages that hold our shortcodes in the dropdowns from the Membership Pages section. Select the page where you wish to redirect your newly registered members when using the [pms-register] shortcode. This also affects Profile Builder forms if the Subscription Plans field is added to the form. Select the page that holds the [pms-login] shortcode. Select the page that holds the [pms-register] shortcode. Select the page that holds the [pms-account] shortcode. Select the page that holds the [pms-recover-password] shortcode. These pages are used for the Redirect Default WordPress pages option from above.